Copyright Nagano Prefecture All Rights Reserved. Nagano Prefecture announced on October 15, 2013, that projects registered in its "One Renewable Energy Project Per Community" registration program. This was the second round of local initiatives under the program, which has been accepting applications since October 2012. The program is designed to improve energy self-sufficiency and stimulate the local economy through projects utilizing one or more types of renewable energy technologies in each municipality, as well as developing local specialty products and launching renewable energy businesses. As of September 30, 2013, 43 cases were registered under the program, using various kinds of renewable energy technologies, including solar power, biomass, micro-hydroelectricity, "green" heat (renewable heat), wind power, and snow-ice-cryogenic energy. 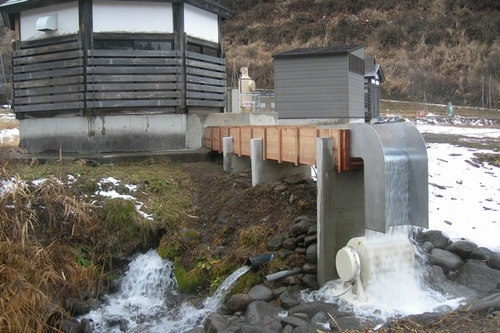 Some of the initiatives introduced include high-efficiency heat pumps at hotspring spa facilities to reduce costs and carbon dioxide emissions, forest protection through the use of locally generated forest biomass from forest thinning, and the construction of a community center based on the use of three kinds of self-sufficient renewable energies.